Mast cells are pivotal effector cells in IgE-mediated allergic reactions. GATA transcriptional factors such as GATA-1 and GATA-2 are expressed in mast cells, and recent studies have revealed that both GATA-1 and GATA-2 are required for mast cell development. However, the role of GATA transcriptional factors in differentiated mast cells has remained largely unknown. In this study, we repressed the activity of GATA-1 and GATA-2 by using three different approaches (inducible overexpression of a dominant-negative form of GATA, pharmacological inactivation, or small interfering RNA technology), and analyzed the molecular mechanisms of GATA transcriptional factors in the activation of mast cells. Surprisingly, the repression of GATA activity in differentiated mast cells led to the impairment of cell survival, IgE-induced degranulation, and cytokine production. Signal transduction and histone modification in the chromatin related to protein kinase Cβ were defective in these cells. These results identify that GATA has a critical role in the activation of mast cell. Inflammatory substances released by mast cells induce and maintain the allergic response (1). The major mechanism of the stimulation of these cells is the interaction of Ags with IgE bound to the high-affinity receptor, FcεRI, on the cell surface. This interaction results in the release of preformed mediators from granules and the generation of newly synthesized mediators, such as cytokines and the products of arachidonic acid. GATA proteins are tissue-restricted transcription factors that bind a WGATAR DNA motif through a zinc-finger DNA-binding domain. Based on sequence homology and expression patterns, GATA proteins have been divided into two subfamilies, i.e., GATA-1–3 and GATA-4–6 (2). The former family is prominently expressed in hemopoietic stem cells and the latter is expressed in various mesoderm- and endoderm-derived tissues (3). Gain-of-function and loss-of-function studies demonstrated the necessity of GATA-1 and GATA-2 for proper hemopoietic development (4). Mast cells express GATA-1 and GATA-2, and recent studies have revealed that both GATA-1 and GATA-2 are required for the differentiation of mast cells (5, 6, 7). GATA-2, rather than GATA-1, appears to regulate early mast cell gene expression because GATA-2 is expressed at higher levels in immature mast cells (8). However, the role of GATAs may not be limited to the differentiation of mast cells, because GATA-1 and GATA-2 are also expressed in mature mast cells that reside in tissues (8, 9). 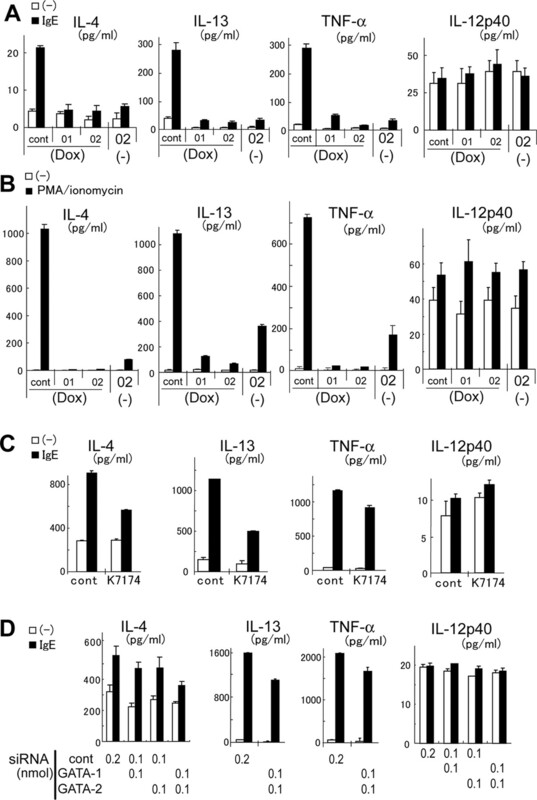 Indirect evidence for a functional role for mast cells is provided by the presence of GATA consensus sequences in the promoter region of carboxypeptidase A, the α- and β-chain of the human IgE receptor (FcεRα and β), IL-4, and IL-13 (10, 11, 12, 13, 14). Ectopic GATA-1 or GATA-2 expression activates the promoter activity of these genes. However, because GATA low-activity mutants are either embryonically lethal or are defective with respect to the differentiation of mast cell lineage (6, 7, 15), the physiological role of GATAs in differentiated mast cells remains largely unknown. In this study, we analyzed the role of GATA transcriptional factors in differentiated mast cells and found that repression of GATA activity leads to the impairment of cell survival, IgE-induced degranulation and cytokine production, and to defective signal transduction. In addition, the repression of GATA activity significantly inhibited anaphylactic responses in vivo. The decreased protein kinase C (PKC)3 β expression and the down-regulation of histone acetylation at the PKCβ regions were observed in GATA-repressed cells. These results indicated that GATA proteins have a critical role in mast cell activation. Recombinant mouse IL-3 and mouse stem cell factor (SCF) were purchased from PeproTech. Doxycycline (Dox), G418, and hygromycin B were purchased from Wako Pure Chemical. K-7174 was obtained from Kowa. The mouse monoclonal anti-dinitrophenol (DNP) Ab, the DNP-human serum albumin (DNP-HSA), ionomycin, and PMA were purchased from Sigma-Aldrich. Rat monoclonal anti-GATA-1, the polyclonal anti-GATA-2, the polyclonal anti-PKCβ1, and the polyclonal anti-PKCβ2 Abs were purchased from Santa Cruz Biotechnology. Mouse anti-SRp20 Ab was purchased from Zymed Laboratories. The polyclonal anti-JAK2, the polyclonal anti-phospho-Akt (Ser473), the polyclonal anti phospho-Lyn (Tyr507), and the polyclonal anti-Bcl-xL Abs were purchased from Cell Signaling Technology. PE-conjugated anti-IgE Ab was purchased from eBioscience. The RBL2H3 rat mast cell line was obtained from the Cell Resource Center for Biomedical Research (Tohoku University, Sendai, Japan) and was grown in RPMI 1640 with 10% FCS. Bone marrow-derived mast cells (BMMCs) were derived from femoral bone marrow cells of BALB/c mice. Cells were cultured with IL-3 (10 ng/ml) for 3 wk and then cultured with IL-3 plus SCF (10 ng/ml each) for 1 wk. The cells consisted of >98% mast cells assessed by toluidine blue staining and FACS analysis of cell surface expression of c-kit and FcεRI. For PMA/ionomycin stimulation, cells were washed twice and incubated (2 × 106 cells/ml) in fresh culture medium for 6 h, then stimulated with PMA (10 ng/ml) plus ionomycin (1 μg/ml). For the cross-linking of FcεRI on mast cells, cells were sensitized by incubating for 2 h with 1 μg/ml anti-DNP IgE in culture medium, washed, incubated (2 × 106 cells/ml) for 6 h in culture medium and stimulated with 50 ng/ml DNP-HSA. BALB/c mice were sacrificed by terminal anesthesia. Tissues were fixed in 4% paraformaldehyde overnight, embedded in paraffin, and 3-μm-thick sections were cut from the paraffin blocks. Double stainings of immunohistochemistry and Alcian blue were performed as follows: sections were deparaffinized in xylene and hydrated with graded alcohols. Ag retrieval was performed in 10 mM citrate buffer (pH 6.0) using a microwave oven for 15 min. After blocking of endogenous peroxidase in H2O2(0.3%)-added methanol for 20 min and incubating with normal goat serum for 20 min, the primary Abs to GATA-1 (dilution 1/200) and GATA-2 (dilution 1/800) were applied and incubated overnight at 4°C. Staining was performed using Histofine Simplestain MAX-PO kit (Nichirei Biosciences). After washing in PBS, the sections were incubated with secondary Ab for 30 min at room temperature, followed by washing in PBS. The Ag-Ab immunoreaction was visualized using diaminobenzidine as a chromogen. Negative controls were processed by omitting the primary Ab-incubating step. After immunohistochemical staining, sections were rinsed in 1% Alcian blue solution for 30 min, followed by counterstaining with Kernechtrot, dehydration, and mounting. To express reverse tet-responsive transcriptional activator in mast cells, the CMV promoter of the pTet-ON plasmid (BD Clontech) was substituted by the EF1α promoter (pEF1α-Tet-ON). The EF1α promoter was isolated from pEFBOS-Flag vector with HindIII-EcoRI and cloned into the HindIII- EcoRI site of the pEGFP-N1 vector. Then, this vector was partially digested with the XhoI-EcoRI site, and a 1.5-kbp product containing the EF1α promoter was cloned into the XhoI-EcoRI sites of pTet-ON (partially digested; 6.7-kbp fragment). To generate the inducible expression plasmid for the dominant-negative (DN)-GATA (pTRE2hyg-DN-GATA), the cDNA encoded DN-GATA was released from ΔNn plus C plus NF plasmid (14) by NheI and subcloned into the NheI site of pTRE2hyg (BD Clontech). ΔN plus C plus NF consists of the Flag-tagged N-terminal zinc finger of mouse GATA-1. pGATA-1&2-Luc, which is designed to measure transcriptional activity of both GATA-1 and GATA-2, were purchased from Panomics. pNFκB-Luc was described previously (16). RBL2H3 cells were transfected with 5 μg of pEF1α-Tet-ON vector using a T820 electroporation system (BTX). Transfectants were selected with G418 (0.5 mg/ml). After 4 wk, resistant clones were screened by transient transfections with the pTRE-Luc reporter plasmid and a luciferase assay for clones with low background expression and high Dox-dependent inducing of the rtTA regulatory protein. Selected stably transfected pEF1α-Tet-ON RBL2H3 cell clones served as non-DN-GATA-inducible control cells in all experiments (described as a parental clone). In a second selection step, the pTRE2hyg-DN-GATA plasmid was introduced into these clones to allow selection of stably transformed cells in the presence of hygromycin (1.2 mg/ml). Several G418- and hygromycin-resistant cell clones were isolated by single-cell cloning and screened by immunoblot analysis for clones with low background expression and high Dox-dependent inducing of DN-GATA protein. The induction of DN-GATA expression was performed by addition of Dox (1 μg/ml) into culture medium in all experiments. In addition, the parental clone was transfected with pTRE2hyg plasmid alone and selected with hygromycin as described above. Stably transfected pTRE2hyg cell clones served as non-DN-GATA-inducible control cells (described as a TRE clone). DN-GATA-expressing or parental clones were transiently transfected with 3.5 μg of pGATA-1&2-Luc plasmid and 0.1 μg of pRL/SV40 (an internal control) by electroporation as described above. BMMCs were transiently transfected with 3.5 μg of pGATA-1&2-Luc plasmid and 0.1 μg of pRL/SV40 (an internal control) using HVJ vector (Genome-One-Neo purchased from Ishihara Sangyo) according to the manufacturer’s instruction. Forty-eight hours after the transfection, the luciferase activity was measured by using the Dual-Luciferase Reporter Assay System (Toyo Ink) according to the manufacturer’s instructions. The siRNA used for transfections were: GATA-1 (D-045656-04; Dharmacon), GATA-2 (D-062114-02; Dharmacon), and control (nontargeting siRNA, D-1210-02; Dharmacon). The total amount of 200 pM siRNA duplexes was transfected into BMMCs (0.5 × 106 cells) by using 1 arbitrary unit of HVJ-E vector (Genome-One-Neo) according to the manufacturer’s instruction. Eleven-week-old BALB/c mice (SLC) were purchased (Japan SLC). Anti-DNP IgE (2.5 mg/ml) and experimental molecules in 20 μl of PBS were applied to the ear of the mice by intradermal injection. A total of 0.5 μl of 1 mM K-7174 or DMSO (control) was injected into the ears of mice intradermally simultaneously with anti-DNP IgE injections. Sixteen hours later, 2% Evans blue (Wako) and Ag, 1 mg/ml DNP-HSA (Sigma-Aldrich), in 100 μl of PBS was injected via the tail vein (i.v.). Thirty minutes later, the mice were sacrificed by terminal anesthesia, and photographed. Both ears were removed, and the extravasated Evans blue was extracted by incubating the skin samples in 99% N, N-dimethylformamide for 24 h at 55°C. The supernatant was collected by centrifugation and OD was read at 620 nm. PCA response was quantified by dye extraction from IgE-injected and PBS-injected ears. The parental (cont) and DN-GATA-expressing clones (01 and 02) were incubated with Dox for 2 days. Then, cells were stimulated with PMA/ionomycin for 4 h, and total cellular RNA was prepared using TRIzol reagent (Invitrogen Life Technologies) and purified with a GenElute mammalian total RNA elution kit (Sigma-Aldrich). Relative mRNA levels were assessed using the Affymetrix gene chip Rat Expression Array 230A, containing probes for ∼16,000 genes. Samples were processed into cRNA, hybridized to chips, and scanned at the Takara bio Dragon Genomics Center (Mie, Japan). Data sets were analyzed using Microarray Suite software (version 5.0). For each gene, a Wilcoxon signed-rank test was applied to the absolute signal intensities in the DN-GATA vs the control data set. Transcripts were defined as up-regulated or down-regulated only when identified as significantly different (p < 0.005). RNA was isolated by using the QuickGene-810 system (Fuji). During this purification process, the RNA was DNase treated. Reverse transcription reactions were performed with 2 μg of total RNA using Superscript II (Invitrogen Life Technologies) reverse transcriptase as previously described (17). The quantitative real-time PCRs were performed using SYBR Green real-time PCR master mix (Toyobo) in a MX3000P (Stratagene) according to manufacturer’s protocols. Primer sequences were as follows: PKCβ1 sense, 5′-GCTAGAGACAAGCGAGACA-3′; antisense, 5′-ACACAGGCTCAGCGATGGA-3′; PKCβ2 sense, 5′- TGTCATTCAAGCTCAACAGCTATCA-3′; antisense, 5′- ACACAGGCTCAGCGATGGA-3′; GAPDH sense, 5′-CTTCATTGACCTCAACTACATG-3′; antisense, 5′-TGTCAT GGATGACCTTGGCCAG-3′. Nuclear and cytoplasmic lysate preparation, and Western blotting were performed as previously described (14, 18). β-Hexosaminidase release assay was performed as previously described (19). Results were expressed as percentage of total β-hexosaminidase activity present in the cells. Results were expressed as percentage of total β-hexosaminidase activity present in the cells. Murine IL-4, IL-12p40, and TNF-α immunoassay kits (BD Pharmingen), murine IL-13 ELISA and rat IL-13 ELISA kits (R&D Systems), and rat IL-4, IL-12p40, and TNF-α immunoassay kits (BioSource International) were used according to the manufacturer’s instructions. Proliferation was measured by 3-(4,5-dimethylthiazol-2-yl)-5-(3-carboxymethoxyphenyl)-2-(4-sulfophenyl)-2H-tetrazolium (MTS) assay as previously described (20). Corrected absorbance at 490 nm was calculated by subtracting the background absorbance (medium alone). Apoptosis of mast cells was measured using the Annexin VFITC apoptosis detention kit according to the manufacturer’s instruction (MBL). The flow cytometric analysis was performed using a FACSCalibur flow cytometer (BD Biosciences). Cells were sensitized by incubating for 2 h with 1 μg/ml anti-DNP IgE in culture medium. Then cells were stained with PE-conjugated anti-IgE Ab. After washing, the cells were resuspended and analyzed using a FACSCalibur flow cytometer (BD Biosciences). Human phospho-JNK (pan) ELISA kit (R&D Systems) was used according to the manufacturer’s instruction. This assay also recognizes mouse and rat phospho-JNK. ChIP assay was performed according to the manufacturer’s instruction (Upstate Biotechnology). The quantitative real-time PCRs were performed using Real-time PCR master mix (Toyobo) in a MX3000P (Stratagene) according to the manufacturer’s protocols. Primer sequences were as follows: the PKCβ promoter-specific primers are as follows: PKCβ pro1 (−927 to −784): sense, GGTACTTACAACCACATAGACA; antisense, CTTGCTCCAACGAACCCTTAGA; probe, FAM-CTCTGCTTGCTCCAACGAACCCTT-TAMRA. PKCβ pro2 (−261 to −187): sense, CCTTGAACCCTTCGGGTACT; antisense, CCAGCCAAGTGTTCTTAGCC; probe, FAM-CCGCCCAGAGCCGCCAGCT-TAMRA. Intron2 of JAK2-specific primers were as follows: sense, TGTATGGGAAGGGTTTGACTCC; antisense, GGCAAAGGACAAGTCTGTGC; probe, FAM-CACAAGAGGGCAGCACCA CCAGGC-TAMRA. To investigate the role of GATA transcriptional factors in mast cells, we examined a well-established basophilic mast cell line RBL2H3 and BMMCs. As shown in Fig. 1⇓A, both GATA-1 and GATA-2 were expressed in the RBL2H3 cells, as previously described (Fig. 1⇓A) (10). In BMMCs prepared with IL-3 alone, GATA-2 expression was observed, although GATA-1 expression was below the level of detection. When the culture medium was supplemented with the SCF, BMMCs expressed detectable amounts of the GATA-1 protein and significant amounts of the GATA-2 protein (Fig. 1⇓A). Because SCF is known to induce maturation of mast cells (21), these results indicate that GATA-1 and GATA-2 are abundantly expressed in differentiated BMMCs. A, Expression of GATA transcriptional factor in RBL2H3 and BMMCs. BMMCs were cultured with IL-3 for 3 wk and then cultured with IL-3 plus SCF or IL-3 alone for 1 wk. Nuclear extracts were harvested and Western blot analyses were performed using GATA-1, GATA-2, or SRp20 (control) specific Ab. B, Expression of GATA-2 in tissue mast cells. A section was stained with Alcian blue and GATA-2-specific Ab. Arrows indicate mast cells that express GATA2 protein. The data of second Ab alone (control) is shown to rule out the possibility of nonspecific staining by anti-GATA-2 Ab. Although various mast cell lines and BMMCs have been reported to express GATA-1 or GATA-2 (10), the in vivo expression of GATA proteins in mast cells remains controversial (8, 9, 22). To confirm the expression of GATA proteins in mast cells distributed in tissue, immunohistochemical analysis was performed using GATA-specific Abs along with Alcian blue staining. As shown in Fig. 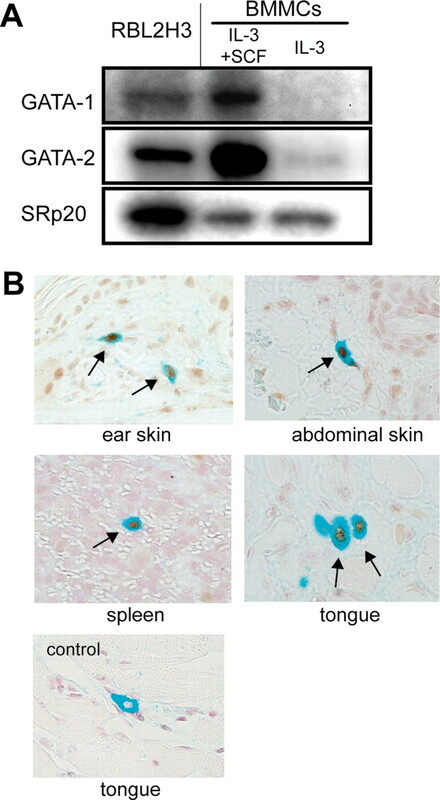 1⇑B, GATA-2 expression was observed in mast cells in various mouse tissue, such as the skin on the ear and the abdomen, the tongue, and the spleen (Fig. 1⇑B). In contrast, GATA-1 expression was below the level of detection in tissue mast cells, although the nuclei of megakaryocytes were clearly stained with the same Ab (data not shown). These data suggest that GATA-2 protein is expressed in mast cells in vivo as well as in mast cell lines and BMMCs. In an attempt to specifically repress the activities of GATA-1 and GATA-2, we used the inducible overexpression of a DN form of GATA (DN-GATA), the specific GATA inhibitor (K-7174) and siRNA technology. DN-GATA is a deletion mutant of GATA-1, which consists of the N-terminal zinc finger of GATA-1. We previously described that the overexpression of this deletion mutant significantly inhibited the transactivation of IL-13 promoter in mast cells (14). Because we could not obtain cell lines that express DN-GATA stably, we selected the tetracycline-inducible expression system for the expression of DN-GATA in the RBL-2H3 cells. Two clones expressing this deletion mutant were isolated for analyses. As shown in Fig. 2⇓A, DN-GATA expression was significantly induced in these cell lines in the presence of Dox. To confirm whether this deletion mutant actually worked in a DN fashion, we examined GATA transcriptional activity using a luciferase reporter plasmid designed to measure transcriptional activity of both GATA-1 and GATA-2 (pGATA-1&2-Luc). As shown in Fig. 2⇓B, the absence of Dox resulted in a moderate reduction in the GATA activity in these cell lines, suggesting that the background expression of DN-GATA can suppress GATA activity. However, a severe reduction was observed after Dox supplementation. In contrast, NF-κB activity did not affected by expression of DN-GATA (Fig. 2⇓B). These results indicate that DN-GATA really worked in a DN fashion. Suppression of GATA activity in mast cells. A, Inducible expression of DN-GATA in RBL2H3 cells. Western blot analysis was performed with nuclear extracts from the parental (cont), the clone transfected with vector alone (TRE), and DN-GATA-expressing clones (01 and 02) treated with Dox for the indicated days. The membrane was probed with an anti-Flag Ab, as DN-GATA is tagged with Flag. B, Repression of GATA transcriptional activity by DN-GATA. Cells were transiently transfected with 1 μg of pGATA-1&2-Luc plasmid and 0.1 μg of pRL/SV40. Cells were incubated with Dox or not for 2 days and then luciferase activities were measured. 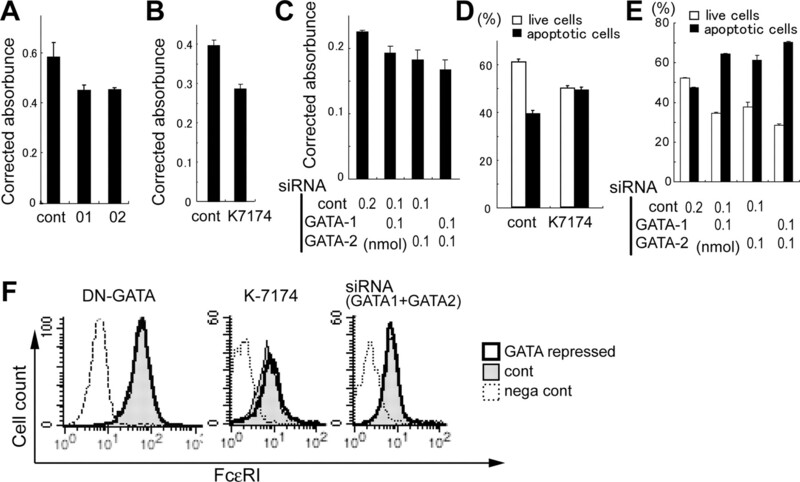 C, Repression of GATA transcriptional activity by K-7174. BMMCs were transiently transfected with 1 μg of pGATA-1&2-Luc plasmid and 0.1 μg of pRL/SV40 using HVJ vector. After 32 h, K-7174 was added to culture medium and incubated for 16 h. Then luciferase activities were measured. D, Inhibition of GATA protein production by siRNA. BMMCs were transfected with the indicated amount of nonspecific control siRNA (cont) or specific siRNA for GATA-1 or GATA-2 using HVJ vector. After 2 days, nuclear extracts were harvested and Western blot analyses were performed using GATA-1, GATA-2, or SRp20 (control) specific Ab. E, Repression of GATA transcriptional activity by siRNA. BMMCs were transfected with indicated amounts of nonspecific control siRNA (cont) or specific siRNA for GATA-1 or GATA-2 using HVJ vector. After 2 days, luciferase activities were measured. To examine NF-κB activity, cells were transfected with 1 μg of pNFκB-Luc and 0.1 μg of pRL/SV40. Cells were stimulated with IgE cross-linking for 16 h or not. Units of luciferase activity were normalized based on values of pRL/SV40 activity for transfection activity (relative luciferase activity). The fold inductions were calculated as follows: (relative luciferase activity of stimulated cells)/(relative luciferase activity of unstimulated cells). A typical result of at least three independent experiments is shown. In BMMCs, we used K-7174 and siRNA to repress GATA activity. K-7174 was developed as a low m.w. anti-inflammatory drug; it is known to be a specific inhibitor of GATA (23). To examine whether K-7174 represses GATA activity in mast cells, BMMCs were transfected with pGATA-1&2-Luc using the HVJ vector, and GATA transcriptional activity was measured. As shown in Fig. 2⇑C, K-7174 inhibited GATA transcriptional activity in BMMCs. Transfection of BMMCs with GATA-1 and GATA-2 siRNAs by using the HVJ vector resulted in markedly decreased levels of the GATA-1 and GATA-2 proteins, respectively, when compared with those obtained with the control siRNA (Fig. 2⇑D). RT-PCR analysis showed that these siRNAs produced an ∼70% reduction in both GATA-1 and GATA-2 mRNAs (data not shown). As shown in Fig. 2⇑E, these siRNAs inhibited the GATA transcriptional activity in BMMCs. (Fig. 2⇑E). Because these three strategies (DN-GATA, siRNA, and K-7174) can repress the GATA activity within 2 days, the role of GATA in mast cells can be analyzed with minimum influences from the cell differentiation status. Degranulation is considered to be a major function of mast cells. To determine whether the GATA activity was required for degranulation, we investigated the granule release from the mast cells by measuring the extracellular activity of β-hexosaminidase, a marker enzyme for histamine-containing granules. As shown in Fig. 3⇓A, DN-GATA-expressing cell lines that were not induced with Dox revealed a moderate inhibition of degranulation; severe suppression of GATA activity by Dox supplementation resulted in the complete inhibition of degranulation. Inhibition of degranulation by suppression of GATA activity. A–C, Degranulation was assessed by measuring the release of β-hexosaminidase in the supernatant. A, The parental (cont) and DN-GATA-expressing clones (01 and 02) were incubated with Dox or not (−) for 2 days and then stimulated with IgE cross-linking. B, BMMCs were incubated with K-7174 (15 μM) or DMSO (cont) for 16 h and then stimulated with IgE cross-linking. C, BMMCs were transfected with indicated amount of nonspecific control siRNA (cont) or specific siRNA for GATA-1 or GATA-2 using HVJ vector. After 2 days, cells were stimulated with IgE cross-linking. D, Typical photographs of the PCA reaction from among five tests. E, Analytical data regarding the extravasated Evans blue. A typical result of three independent experiments is shown. Data are expressed as A620 = absorbance 620 nm of IgE-sensitized ear minus absorbance 620 nm of saline-injected ear. The error bars represent SD values. The experiments were done in triplicate. The error bars represent SD values. Furthermore, the suppression of degranulation was also confirmed in BMMCs in which the GATA activity was suppressed with GATA inhibitor or siRNA (Fig. 3⇑, B and C). Both GATA-1 and GATA-2 siRNAs inhibited the degranulation from mast cells and the combination of these siRNA inhibited more significantly (Fig. 3⇑C). We next assessed the efficacy of the GATA inhibitor in suppressing degranulation from normal tissue-resident mast cells in vivo. The immediate hypersensitivity reaction was analyzed by local PCA. K-7174 or DMSO (control) was injected intradermally into the ears of mice simultaneously with anti-DNP IgE injections. On the next day, DNP-HSA together with Evan’s blue was injected i.v. Within 5 min after this antigenic challenge, the mast cell-dependent PCA increased vascular permeability, causing local dye extravasation in the IgE-injected skin but not in the PBS-injected skin. As shown in Fig. 3⇑, D and E, the size and color intensity of the reaction at the sites of K-7174 injection were significantly decreased when compared with those at the sites injected with DMSO. These data clarify the importance of GATA transcriptional factors in degranulation from mast cells. Because it has been reported that the GATA-binding sites in IL-4 and IL-13 promoters are necessary for their transcriptional activity in mast cells (13, 14), we examined whether the suppression of GATA activity would affect the cytokine production from mast cells. As shown in Fig. 4⇓A, after IgE cross-linking, the production of IL-4, IL-13, and TNF-α was significantly inhibited in DN-GATA-expressing cell lines. In contrast, the production of IL-12p40 was not affected in these cells. A similar inhibition of cytokine production was also observed in cells stimulated with PMA and ionomycin (Fig. 4⇓B). Although the cells induced with Dox showed more severe reductions in PMA/ionomycin stimulation, DN-GATA-expressing cell lines that were not induced with Dox also showed significant reduction of cytokine production, suggesting that mild suppression of GATA activity is enough for inhibition of the cytokine productions. Additionally, inhibition of cytokine production was also confirmed in BMMCs in which GATA activity was suppressed using a GATA inhibitor or siRNAs (Fig. 4⇓, C and D). Inhibition of cytokine production by suppression of GATA activity. Cells were stimulated with IgE cross-linking or PMA/ionomycin. After 16 h, the cell-free culture supernatants were collected and cytokine ELISAs were performed. A, IgE cross-linking induced cytokine production from DN-GATA-expressing cells. The parental (cont) and DN-GATA-expressing clones (01 and 02) were incubated with Dox or not (−) for 2 days and then stimulated with IgE cross-linking. B, PMA/ionomycin induced cytokine production from DN-GATA-expressing cells. Cells were incubated with Dox or not for 2 days and then stimulated with PMA/ionomycin. C, IgE cross-linking induced cytokine production from BMMCs treated with K-7174 (15 μM) or DMSO (cont). Cells were incubated with K-7174 for 16 h and then stimulated with IgE cross-linking. D, IgE cross-linking induced cytokine production from BMMCs treated with siRNA. Cells were transfected with indicated amount of nonspecific control siRNA (cont) or specific siRNA for GATA-1 or GATA-2 using HVJ vector. After 2 days, cells were stimulated with IgE cross-linking. We confirmed that 16 h incubation did not significantly affect the number of cells (data not shown). The experiments were done in triplicate. The error bars represent SD values. Using the MTS assay, we next examined whether the repression of GATA activity inhibited proliferation of mast cells. As shown in Fig. 5⇓, A–E, the suppression of GATA activity inhibited their proliferation and promoted apoptosis of mast cells. A–C, Inhibition of mast cell proliferation by repression of GATA activity. Cells (2 × 104 cells) were incubated in 96-well microplates. After 48 h, cell number was measured by MTS assay. Corrected absorbance was calculated as described in Materials and Methods. A, The parental (cont) and DN-GATA-expressing clones (01 and 02) were incubated with Dox for 2 days. Then cells were washed twice and incubated with Dox again. B, BMMCs (2 × 104 cells) were incubated with K-7174 (15 μM) or DMSO (cont) in RPMI 1640 plus 10% FCS supplemented with IL-3 plus SCF. C, BMMCs were transfected with nonspecific control siRNA (cont) or specific siRNA for GATA-1 or GATA-2 using HVJ vector. After 2 days, cells were washed twice and incubated in RPMI 1640 plus 10% FCS supplemented with IL-3 plus SCF. D, Promotion of mast cell apoptosis by repression of GATA activity. BMMCs were incubated with K-7174 (15 μM) or DMSO (cont) in RPMI 1640 plus 10% FCS for 14 h. Then, the cells were stained with Annexin VFITC and propidium iodide and analyzed by flow cytometry. E, Promotion of mast cell apoptosis by repression of GATA activity. BMMCs were transfected with nonspecific control siRNA (cont) or specific siRNA for GATA-1 or GATA-2 using HVJ vector. After 2 days, cells were washed twice and incubated in RPMI 1640 plus 10% FCS for 16 h. Then, the cells were stained with Annexin VFITC and propidium iodide, and analyzed by flow cytometry. F, Expression of FcεRI on mast cells. Cells were prepared as described for A–C and incubated with IgE for 2 h. Then cells were stained with anti-mouse IgE, or isotype match Ab (nega cont). After washing, the cells were resuspended and analyzed by flow cytometry. A typical result of at least three independent experiments is shown. The error bars represent SD values. Although it has been reported that GATA-1 is required for FcεRI expression on mast cells during their development (24), no change in FcεRI expression was observed by the suppression of GATA activity in our experiments (Fig. 5⇑F). Thus, the role of GATA in developed mast cells appeared to be different from that in precursors and alteration of FcεRI expression is not the cause of the inhibited cytokine production and degranulation induced by the suppression of GATA activity in developed mast cells. Taken together, these data strikingly indicate the requirement of GATA activity for homeostasis and activation of mature mast cells. To identify GATA target genes that contribute to the biological effects of GATA on mast cells, we compared the transcripts of DN-GATA-expressing and nonexpressing cell lines stimulated with PMA and ionomycin by using an Affymetrix GeneChip. Approximately 15,000 of nearly 16,000 genes did not show a significantly different hybridization signal between DN-GATA-expressing cells and control cells. The results of important genes are shown in Table I⇓. The transcription of several genes, which has been reported to be transactivated by GATA, was found to be decreased in DN-GATA-expressing cells; including carboxypeptidase A, IL-4, and IL-13 (10, 13, 14). The decrease in IL-4 and IL-13 transcripts is consistent with the above-described ELISA data. Interestingly, the levels of the Bcl-xL and Bcl-A1 genes, which prevent apoptosis of mast cells (20, 25), were decreased in DN-GATA-expressing cells, indicating the contribution of these genes to GATA-dependent cell survival. Among the various transcripts that encode proteins related to signal transduction, the level of the PKCβ gene was decreased. Although the levels of the Bruton tyrosine kinase (Btk) gene and the phospholipase C (PLC)-γ1 gene were increased, these genes have been known to positively regulate downstream signals and mast cell activation (26, 27). Therefore, these up-regulations are not the cause of mast cell inactivation occurring due to the repression of GATA activity. Probably, these up-regulations are a secondary effect of the repression of GATA activity. Real-time PCR and Western blot analyses showed that PKCβI, PKCβII, and Bcl-xL were significantly down-regulated in BMMCs treated with siRNA or the GATA inhibitor as well as in DN-GATA-expressing cell lines (Fig. 6⇓, A and B). A, Real-time PCR analysis of PKCβ mRNA in DN-GATA-expressing cells. The parental (cont), the clone transfected with vector alone (TRE), and DN-GATA-expressing clones (02) were incubated with Dox or not (−) for 2 days. Total RNA was reverse-transcribed, and PKCβ1, PKCβ2, and GAPDH cDNAs were amplified by real-time PCR. The error bars represent SD values. B, Western blot analysis of PKCβ1, PKCβ2, and Bcl-xL expression. DN-GATA-expressing clones were incubated with Dox for 2 days (DN-GATA). BMMCs were incubated with K-7174 (15 μM) or not for 16 h (K-7174). BMMCs were transfected with nonspecific control siRNA (cont) or specific siRNAs for GATA-1 and GATA-2 (GATA), and incubated for 48 h. C, Inhibition of signal transduction by repression of GATA activity. The parental (cont) and DN-GATA-expressing clones (02) were incubated with Dox for 2 days. Cells were washed and resuspended in RPMI 1640 plus 10% FCS. After 6 h, cells were stimulated with IgE cross-linking for the indicated time and cell lysates were harvested. Phosphorylation of JNK was analyzed using the phospho-JNK-specific ELISA kit. Phosphorylation of Akt was analyzed by Western blot. D, Phosphorylation of Lyn in DN-GATA-expressing cells. Cell lysates were harvested as described for Fig. 6⇓C. Western blot analysis was performed using phospho-Lyn-specific Ab. E, Acetylation levels of histone H3 and H4 at the PKCβ gene. The parental (cont) and DN-GATA-expressing clones (02) were incubated with Dox for 2 days. For the analysis of histone acetylation, the ChIP assays were conducted using anti-acetyl H3 or H4 Ab. For the analysis of binding of GATA, anti-GATA-1 or GATA-2 Ab was used. ChIP assays were quantified by real-time PCR using probes specific to the PKCβ promoter (two regions were analyzed; pro1, −927 to −784 and pro2, −261 to −187) and JAK2 intron2 (JAK2). Results are expressed as the fold increase over the levels detected in the control cells after correcting for differences in the amount of starting (input) chromatin material. The error bars represent SD values. We then examined the downstream signals of PKCβ in GATA-repressed mast cells after FcεRI cross-linking. Regarding the signal transduction pathway from FcεRI, it has been reported that PKCβ is involved in JNK and Akt activation (27, 28). Surprisingly, we found that the phosphorylation of both JNK and Akt (Ser473) was significantly inhibited in DN-GATA-expressing cells (Fig. 6⇑C). In contrast, Lyn, which is rapidly phosphorylated after FcεRI cross-linking and upstream of PKCβ (27, 29), was normally phosphorylated in DN-GATA-expressing cells (Fig. 6⇑D). These results indicate the inactivation of downstream signal transduction of PKCβ in DN-GATA-expressing cell lines, presumably due to the decreased PKCβ expression. It has been reported that GATA transcriptional factors regulate tissue-specific gene expression through the modification of histone acetylation (30). To investigate the possibility of histone modification by GATA in the regulation of the PKCβ gene in mast cells, we examined H3 and H4 acetylation in DN-GATA-expressing cell lines after the suppression of GATA activity. We applied the ChIP assay using specific primers for the PKCβ promoter. As shown in Fig. 6⇑E, H3 and H4 acetylation in the PKCβ promoter region was significantly decreased in DN-GATA-expressing cells, although acetylation in the control gene (JAK2) did not change. Additionally, the down-regulation of histone acetylation at the IL-4 promoter and Bcl-x promoter regions was observed in GATA-repressed cells (data not shown). A search in the nucleotide sequence of the PKCβ promoter for the potential binding sites of transcriptional factors was conducted using TRANSFAC (www.motif.genome.ad.jp; cutoff score = 85) and the GATA-binding site was found in the region between −905 and −893. The ChIP assay indicated that binding of GATA to this region was decreased in DN-GATA-expressing cells (Fig. 6⇑E, PKCβpro1). These results indicate that GATA regulates PKCβ gene expression through histone modification. In this study, we have shown the existence of GATA proteins in mast cell lines, BMMCs, and tissue mast cells and that the repression of GATA activity significantly inhibits cytokine production, degranulation, and survival of mast cells, indicating that the GATA activity is indispensable for homeostasis and activation of mature mast cells. Microarray analysis has revealed that the transcription of several cytokines, their receptors, and apoptosis-related genes was under the control of GATA transcriptional factors in mast cells. Among the various genes related to signal transduction, PKCβ was down-regulated in GATA-repressed mast cells. Lyn, which is rapidly phosphorylated after FcεRI cross-linking in the upstream of PKCβ, was normally phosphorylated in the GATA-repressed mast cells. In contrast, downstream signals such as the phosphorylation of JNK and Akt were abrogated. Finally, we have shown that histone acetylation at the PKCβ gene region was significantly down-regulated in the GATA-repressed mast cells. Mast cell precursors leave bone marrow, migrate in the blood, and differentiate into mature cells after tissue invasion (31). We have shown that the GATA-2 protein is expressed in mast cells distributed in various tissues in mice (Fig. 1⇑B). In addition, it has been reported that mouse peritoneal mast cells express the GATA-1 protein (9) and that human skin mast cells express the GATA-2 protein (8). Therefore, it appeared that differentiated mast cells express GATA-1 or GATA-2. Because previous reports have shown that the GATA-2 mRNA is highly expressed in the undifferentiated mast cell lineage and down-regulated during its differentiation (22), the GATA-2 expression in mature mast cells may not be so abundant. It has been indicated that GATA transactivates gene transcription through the regulation of chromatin accessibility. For example, GATA-3 interacts with methyl CpG-binding domain protein-2 that regulates DNA methylation in the inactivation of chromatin and promotes Th2 cytokine expression (32). GATA-1 associates with the CREB-binding proteins CBP/p300, coactivating factors that have intrinsic histone acetyl transferase activity, and promotes β-globin gene expression (30). The PKCβ gene encodes two mRNAs, namely, PKCβI and PKCβII, which originate from the alternative splicing of the C-terminal exons (33). In the present study, we have shown that the repression of GATA activity significantly decreased both PKCβI and PKCβII expression (Fig. 6⇑, A and B). Although the transcriptional initiation site has been reported (34), little is known about the transcriptional regulation of PKCβ. Because our data indicated that histone acetylation and binding of GATA protein in the PKCβ promoter was decreased after the repression of GATA activity (Fig. 6⇑E), it is quite conceivable that chromatin accessibility contributes to the transcriptional regulation of PKCβ. Interestingly, our microarray data indicated that the suppression of GATA activity down-regulated phospholipase D2 (PLD2) expression (Table I⇑), which is necessary for PKC activation in mast cells (35). PKCβ activity may be suppressed through this pathway in addition to its decreased expression. Actually, PKCβ activity was significantly suppressed after the repression of GATA activity, as our experiments on signal transduction indicated (Fig. 6⇑, C and D). Although mast cells express several isoforms of PKC (36), various reports have indicated the importance of PKCβ in the signal transduction of mast cells leading to cytokine production and degranulation. IL-6 production and degranulation were inhibited in BMMCs derived from PKCβ-deficient mice (37). JNK activation and the transactivation of IL-2 and TNF-α promoter were suppressed by overexpression of kinase-dead PKCβ in BMMCs (27). Furthermore, it has been reported that PKCβII regulates Akt activity by directly phosphorylating Ser473, which regulates the cytokine production from mast cells (28, 38). Hence, the down-regulation of PKCβ seems to be a major factor in the inhibition of mast cell activation by the repression of GATA activity. In contrast to degranulation and cytokine production, it has been reported that the deficiency of PKCβ in mast cells did not affect their rate of proliferation and apoptosis (37). This fact indicates the contribution of mechanisms other than the down-regulation of PKCβ to the survival of mast cells. In this study, the decreased expression of apoptosis-related genes such as Bcl-xL and Bcl-A1, and decreased histone acetylation in the Bcl-xL gene were observed in GATA-repressed mast cells (Table I⇑). Probably the expression of numerous genes is down-regulated through modification of histone acetylation after repression of GATA activity because this function of GATA has a broad activity that can influence hemopoiesis (39). Taken together, we have demonstrated that the repression of GATA activity suppressed various activities of mast cells. Our report may indicate an important clue to treat mast cell-mediated diseases. We thank Dr. K. Shimokata (Nagoya University, Nagoya, Japan) for helpful support and suggestions. ↵1 This work was supported in part by grants from the Japanese Society for the Promotion of Science and the Japanese Allergy Foundation, the Kao Foundation for Arts and Sciences, and the ONO Medical Research Foundation. ↵3 Abbreviations used in this paper: PKC, protein kinase C; SCF, stem cell factor; DNP, dinitrophenol; HSA, human serum albumin; BMMC, bone marrow-derived mast cell; DN, dominant negative; siRNA, small-interfering RNA; Dox, doxycycline; ChIP, chromatin immunoprecipitation; PCA, passive cutaneous anaphylaxis; MTS, 3-(4,5-dimethylthiazol-2-yl)-5-(3-carboxymethoxyphenyl)-2-(4-sulfophenyl)-2H-tetrazolium. Molkentin, J. D.. 2000. The zinc finger-containing transcription factors GATA-4, -5, and -6: ubiquitously expressed regulators of tissue-specific gene expression. J. Biol. Chem. 275: 38949-38952. Orkin, S. H.. 1998. Embryonic stem cells and transgenic mice in the study of hematopoiesis. Int. J. Dev. Biol. 42: 927-934. Shimizu, R., M. Yamamoto. 2005. Gene expression regulation and domain function of hematopoietic GATA factors. Semin. Cell Dev. Biol. 16: 129-136. Tsai, F. Y., S. H. Orkin. 1997. Transcription factor GATA-2 is required for proliferation/survival of early hematopoietic cells and mast cell formation, but not for erythroid and myeloid terminal differentiation. Blood 89: 3636-3643. Walsh, J. C., R. P. DeKoter, H. J. Lee, E. D. Smith, D. W. Lancki, M. F. Gurish, D. S. Friend, R. L. Stevens, J. Anastasi, H. Singh. 2002. Cooperative and antagonistic interplay between PU.1 and GATA-2 in the specification of myeloid cell fates. Immunity 17: 665-676. Migliaccio, A. R., R. A. Rana, M. Sanchez, R. Lorenzini, L. Centurione, L. Bianchi, A. M. Vannucchi, G. Migliaccio, S. H. Orkin. 2003. GATA-1 as a regulator of mast cell differentiation revealed by the phenotype of the GATA-1low mouse mutant. J. Exp. Med. 197: 281-296. Harigae, H., S. Takahashi, N. Suwabe, H. Ohtsu, L. Gu, Z. Yang, F. Y. Tsai, Y. Kitamura, J. D. Engel, M. Yamamoto. 1998. Differential roles of GATA-1 and GATA-2 in growth and differentiation of mast cells. Genes Cells 3: 39-50. Babina, M., Y. Schulke, L. Kirchhof, S. Guhl, R. Franke, S. Bohm, T. Zuberbier, B. M. Henz, A. F. Gombart. 2005. The transcription factor profile of human mast cells in comparison with monocytes and granulocytes. Cell. Mol. Life Sci. 62: 214-226. Zon, L. I., M. F. Gurish, R. L. Stevens, C. Mather, D. S. Reynolds, K. F. Austen, S. H. Orkin. 1991. GATA-binding transcription factors in mast cells regulate the promoter of the mast cell carboxypeptidase A gene. J. Biol. Chem. 266: 22948-22953. Nishiyama, C., T. Yokota, K. Okumura, C. Ra. 1999. The transcription factors Elf-1 and GATA-1 bind to cell-specific enhancer elements of human high-affinity IgE receptor α-chain gene. J. Immunol. 163: 623-630. Maeda, K., C. Nishiyama, T. Tokura, Y. Akizawa, M. Nishiyama, H. Ogawa, K. Okumura, C. Ra. 2003. Regulation of cell type-specific mouse FcεRI β-chain gene expression by GATA-1 via four GATA motifs in the promoter. J. Immunol. 170: 334-340. Kwan, M., D. R. Powell, T. Y. Nachman, M. A. Brown. 2005. An intron GATA-binding site regulates chromatin accessibility and is essential for IL-4 gene expression in mast cells. Eur. J. Immunol. 35: 1267-1274. Masuda, A., Y. Yoshikai, H. Kume, T. Matsuguchi. 2004. The interaction between GATA proteins and activator protein-1 promotes the transcription of IL-13 in mast cells. J. Immunol. 173: 5564-5573. Takahashi, S., R. Shimizu, N. Suwabe, T. Kuroha, K. Yoh, J. Ohta, S. Nishimura, K. C. Lim, J. D. Engel, M. Yamamoto. 2000. GATA factor transgenes under GATA-1 locus control rescue germline GATA-1 mutant deficiencies. Blood 96: 910-916. Iwami, K. I., T. Matsuguchi, A. Masuda, T. Kikuchi, T. Musikacharoen, Y. Yoshikai. 2000. Cutting edge: naturally occurring soluble form of mouse Toll-like receptor 4 inhibits lipopolysaccharide signaling. J. Immunol. 165: 6682-6686. Masuda, A., Y. Yoshikai, K. Aiba, T. Matsuguchi. 2002. Th2 cytokine production from mast cells is directly induced by lipopolysaccharide and distinctly regulated by c-Jun N-terminal kinase and p38 pathways. J. Immunol. 169: 3801-3810. Masuda, A., T. Matsuguchi, K. Yamaki, T. Hayakawa, M. Kubo, W. J. LaRochelle, Y. Yoshikai. 2000. Interleukin-15 induces rapid tyrosine phosphorylation of STAT6 and the expression of interleukin-4 in mouse mast cells. J. Biol. Chem. 275: 29331-29337. Baram, D., R. Adachi, O. Medalia, M. Tuvim, B. F. Dickey, Y. A. Mekori, R. Sagi-Eisenberg. 1999. Synaptotagmin II negatively regulates Ca2+-triggered exocytosis of lysosomes in mast cells. J. Exp. Med. 189: 1649-1658. Masuda, A., T. Matsuguchi, K. Yamaki, T. Hayakawa, Y. Yoshikai. 2001. Interleukin-15 prevents mouse mast cell apoptosis through STAT6-mediated Bcl-xL expression. J. Biol. Chem. 276: 26107-26113. Tsai, M., L. S. Shih, G. F. Newlands, T. Takeishi, K. E. Langley, K. M. Zsebo, H. R. Miller, E. N. Geissler, S. J. Galli. 1991. The rat c-kit ligand, stem cell factor, induces the development of connective tissue-type and mucosal mast cells in vivo: analysis by anatomical distribution, histochemistry, and protease phenotype. J. Exp. Med. 174: 125-131. Jippo, T., H. Mizuno, Z. Xu, S. Nomura, M. Yamamoto, Y. Kitamura. 1996. Abundant expression of transcription factor GATA-2 in proliferating but not in differentiated mast cells in tissues of mice: demonstration by in situ hybridization. Blood 87: 993-998. Umetani, M., H. Nakao, T. Doi, A. Iwasaki, M. Ohtaka, T. Nagoya, C. Mataki, T. Hamakubo, T. Kodama. 2000. 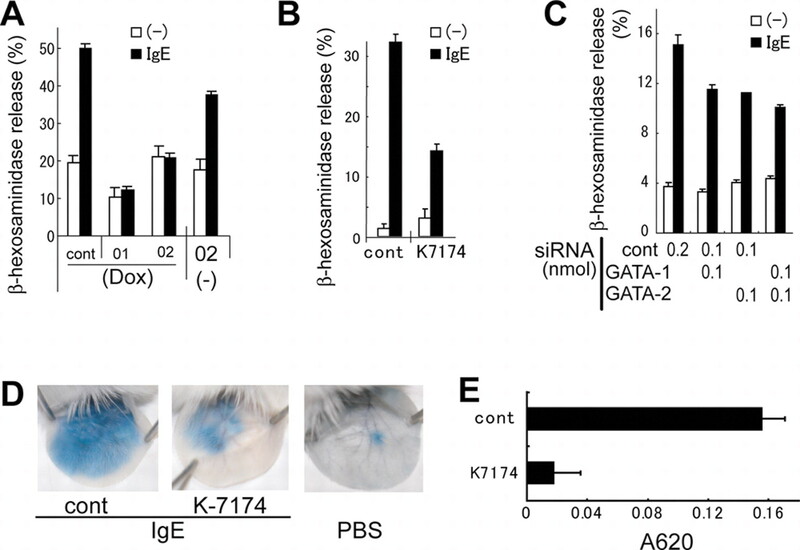 A novel cell adhesion inhibitor, K-7174, reduces the endothelial VCAM-1 induction by inflammatory cytokines, acting through the regulation of GATA. Biochem. Biophys. Res. Commun. 272: 370-374. Nishiyama, C., T. Ito, M. Nishiyama, S. Masaki, K. Maeda, N. Nakano, W. Ng, K. Fukuyama, M. Yamamoto, K. Okumura, H. Ogawa. 2005. GATA-1 is required for expression of FcεRI on mast cells: analysis of mast cells derived from GATA-1 knockdown mouse bone marrow. Int. Immunol. 17: 847-856. Xiang, Z., A. A. Ahmed, C. Moller, K. Nakayama, S. Hatakeyama, G. Nilsson. 2001. Essential role of the prosurvival bcl-2 homologue A1 in mast cell survival after allergic activation. J. Exp. Med. 194: 1561-1569. Hong-Geller, E., D. Holowka, R. P. Siraganian, B. Baird, R. A. Cerione. 2001. Activated Cdc42/Rac reconstitutes FcεRI-mediated Ca2+ mobilization and degranulation in mutant RBL mast cells. Proc. Natl. Acad. Sci. USA 98: 1154-1159. Kawakami, Y., J. Kitaura, S. E. Hartman, C. A. Lowell, R. P. Siraganian, T. Kawakami. 2000. Regulation of protein kinase CβI by two protein-tyrosine kinases, Btk and Syk. Proc. Natl. Acad. Sci. USA 97: 7423-7428. Kawakami, Y., H. Nishimoto, J. Kitaura, M. Maeda-Yamamoto, R. M. Kato, D. R. Littman, M. Leitges, D. J. Rawlings, T. Kawakami. 2004. Protein kinase C βII regulates Akt phosphorylation on Ser-473 in a cell type- and stimulus-specific fashion. J. Biol. Chem. 279: 47720-47725. Tolar, P., L. Draberova, H. Tolarova, P. Draber. 2004. Positive and negative regulation of Fcε receptor I-mediated signaling events by Lyn kinase C-terminal tyrosine phosphorylation. Eur. J. Immunol. 34: 1136-1145. Letting, D. L., C. Rakowski, M. J. Weiss, G. A. Blobel. 2003. Formation of a tissue-specific histone acetylation pattern by the hematopoietic transcription factor GATA-1. Mol. Cell. Biol. 23: 1334-1340. Krishnaswamy, G., O. Ajitawi, D. S. Chi. 2006. The human mast cell: an overview. Methods Mol. Biol. 315: 13-34. Hutchins, A. S., A. C. Mullen, H. W. Lee, K. J. Sykes, F. A. High, B. D. Hendrich, A. P. Bird, S. L. Reiner. 2002. Gene silencing quantitatively controls the function of a developmental trans-activator. Mol. Cell 10: 81-91. Blobe, G. C., W. A. Khan, A. E. Halpern, L. M. Obeid, Y. A. Hannun. 1993. Selective regulation of expression of protein kinase Cβ isoenzymes occurs via alternative splicing. J. Biol. Chem. 268: 10627-10635. Niino, Y. S., S. Ohno, K. Suzuki. 1992. Positive and negative regulation of the transcription of the human protein kinase Cβ gene. J. Biol. Chem. 267: 6158-6163. Peng, Z., M. A. Beaven. 2005. An essential role for phospholipase D in the activation of protein kinase C and degranulation in mast cells. J. Immunol. 174: 5201-5208. Li, G., J. J. Lucas, E. W. Gelfand. 2006. Protein kinase Cα, βI, and βII isozymes regulate cytokine production in mast cells through MEKK2/ERK5-dependent and -independent pathways. Cell. Immunol. 238: 10-18. Nechushtan, H., M. Leitges, C. Cohen, G. Kay, E. Razin. 2000. Inhibition of degranulation and interleukin-6 production in mast cells derived from mice deficient in protein kinase Cβ. Blood 95: 1752-1757. Kitaura, J., K. Asai, M. Maeda-Yamamoto, Y. Kawakami, U. Kikkawa, T. Kawakami. 2000. Akt-dependent cytokine production in mast cells. J. Exp. Med. 192: 729-740. Bresnick, E. H., M. L. Martowicz, S. Pal, K. D. Johnson. 2005. Developmental control via GATA factor interplay at chromatin domains. J. Cell. Physiol. 205: 1-9.